I missed Bobmas! Or at least I didn't have time to properly prepare, unlike these fun-loving Ravelers! And so that I do not miss out on any mirth, joviality and opportunity to socialize with my knitterly non-Muggles, I have entered Bobmas on my Palm, with an annual recurring event. Let there be Bobmas eve events, Bobmas morning photos around the dog bed or the knitting basket, Bobmas day gatherings, and CUPCAKES, drink, food, knitters, knitting, yarn and merriment. All proceeds to be forwarded to Ravelry which has so greatly changed the knitting community world over! Thanks Jess & Casey for a wonderful addition to our knitting community. (Muggles beware, we are out here). 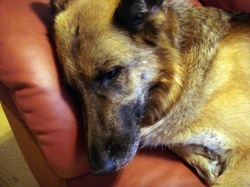 Photos of my two GSDs (Hero on the left, Bagira on the right) napping after their stressful day at the doggy spa on Bobmas Day. 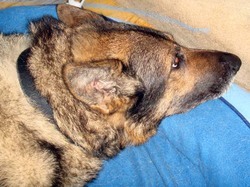 Hero has squatters rights on one of the many doggy beds in the house, while Gira has staked out the sofa next to me! Wonder if there are beef flavored cupcake recipes for dogs next Bobmas???? Are you sick of these yet? Sorry. I'm not - I'm actually getting rather charged up about socks again. 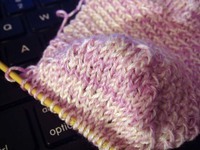 The heel turning section of the Mystery Sock came out today, and so, I've turned the heel. I expect by the weekend, I'll have caught up the second sock while waiting for the next section. 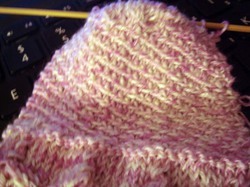 I like the feel of knitting the Tofutsie yarn - I hope I like wearing it as well. So, at this point, I have the first Mystery Sock at the heel, I have finished the first Ocean Toes sock, and I have returned to the Square Feet socks from last spring, rescued from SSS Island. Soon, I shall have a number of pairs of new socks to add to the sock drawer! And thus far, all of these have come from stash yarn. I've also started going through older stash stuff. Yarn I've hauled from Montana to Utah to Maryland to Maine over the course of over a decade now. It was part of trying to photograph stash for Ravelry.... well, it made me realize this yarn needed to be loved by someone else. And so this past weekend, I gifted 300-400 skeins of fairly basic yarns to a co-worker. She can use what she wants, and find other homes for what is left. I still have a lot of very nice stuff I can use! 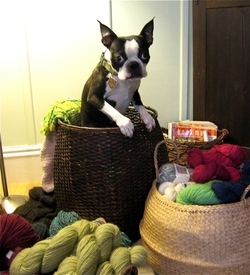 Another positive side effect of joining Ravelry!